Ornaments 9 and 10 in our 12 ornaments of Christmas series come together so fast, which is a good thing since the big day is nearly upon us! 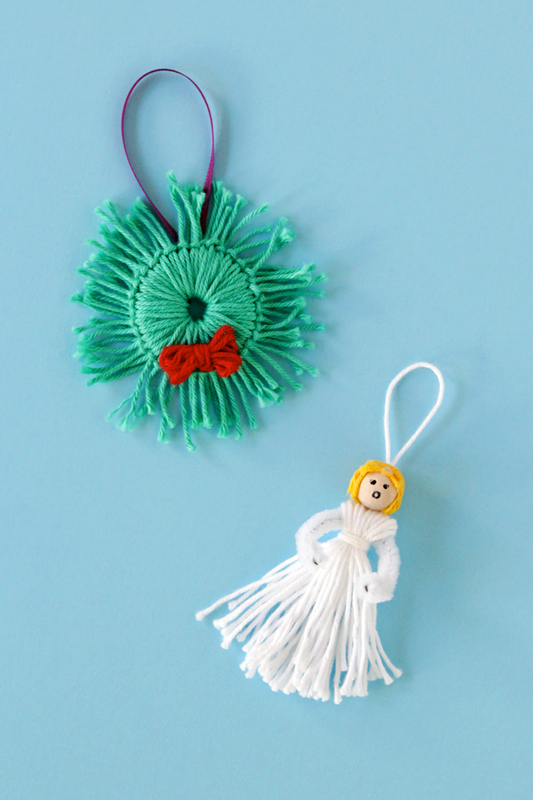 This funky wreath and adorable tassel angel are super fun to make, and they’re both great ways to make use of scrap yarn. Cut a donut shape out of some scrap cardboard, and cut a rectangle that is about 40% taller than the diameter of your donut cutout. Wrap your green yarn around the rectangular piece of cardboard as shown, creating a piece of yarn that’s twice the height of your rectangle. 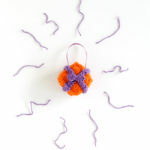 Cut several pieces of yarn to this length, and attach them to the cardboard donut using a cow hitch knot. Keep adding pieces of yarn to the donut until it’s fully covered and no cardboard is peeking through between the strands of yarn. 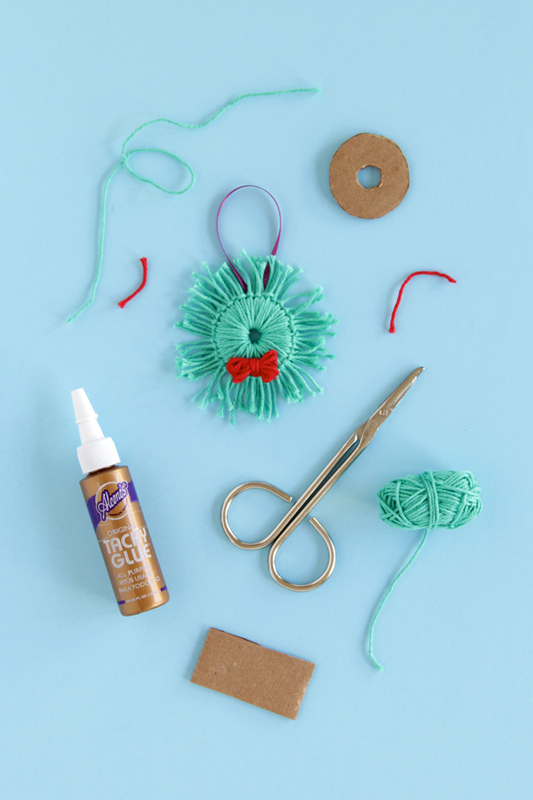 Finally, make a faux bow for your wreath with red yarn and glue that to the center bottom of your wreath. 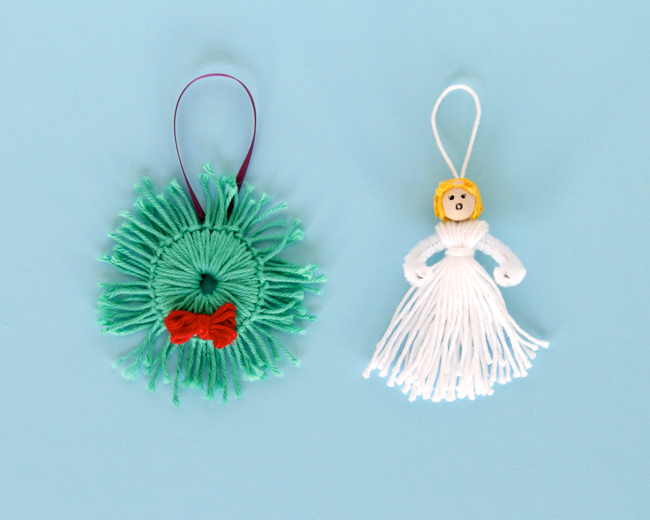 To finish and add a hanger to your ornament, you can glue some ribbon to the center back once your bow has fully dried. Cut a tall rectangle out of a piece of cardboard. You can make it any size you want, but for reference, mine is about 3/4 inch wide by 3 inches tall. Wrap white yarn around the cardboard several times. Cut all of the yarn at one end, being careful to hold the uncut end together. 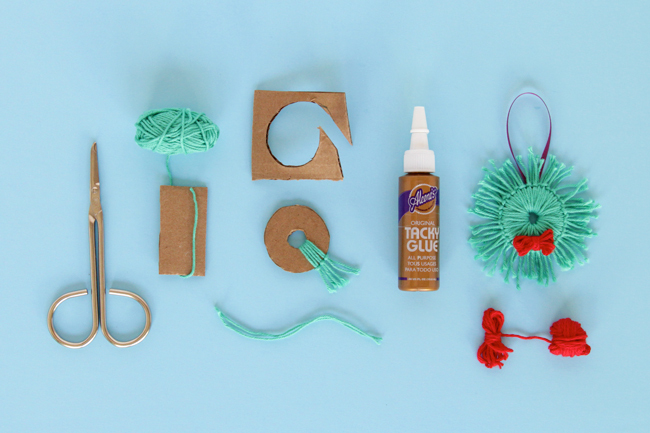 Fold the yarn in half around the pipe cleaner, and wrap some additional white yarn around the yarn on the pipe cleaner – just below the pipe cleaner. 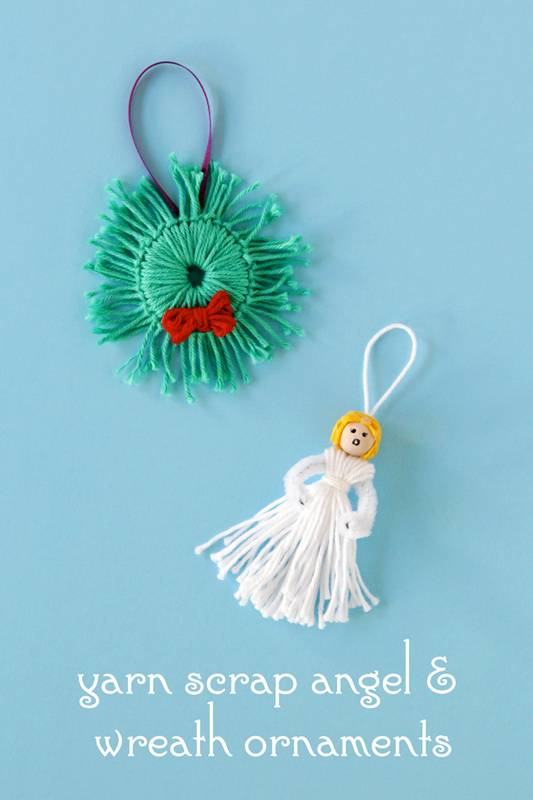 This will form a tassel that functions as your angel’s body/dress, and the pipe cleaners will be her arms. For this next step you might want to use waxed paper or a silicon craft mat, but it’s totally optional. 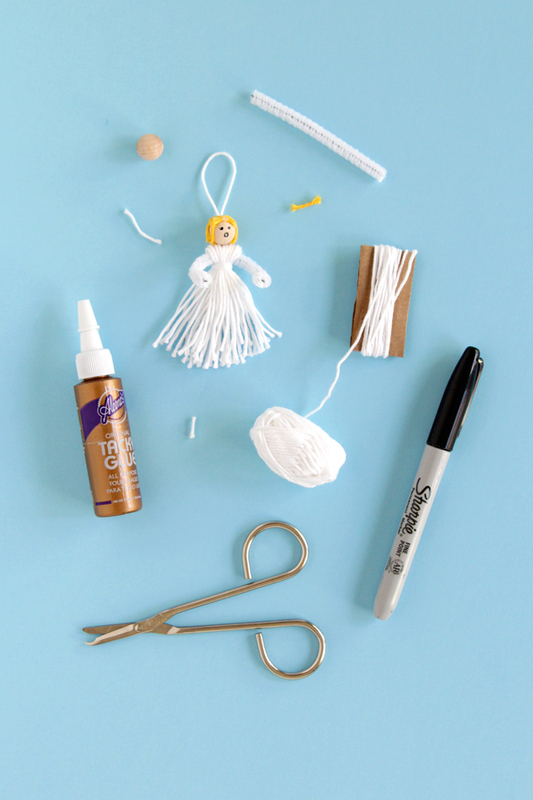 Make your angel a head by gluing small scraps of yellow yarn (or whatever color you prefer) to the wooden bead, creating a bob style haircut. After the hair dries, glue the head to the body with a generous amount of glue. 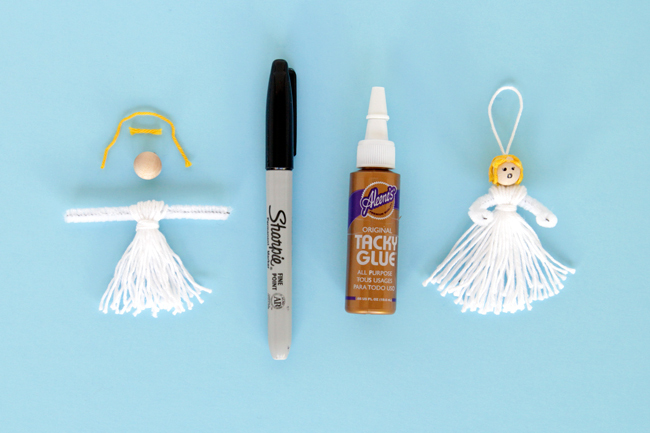 To finish your ornament, wait one final time for the glue to cry completely, then draw a little face on her using permanent marker before gluing some yarn to her back to function as a hanger. Finally! Even these two aren’t knit or crochet ornaments, I’d still love to see your takes on them! You can share using #handsoccupiedhohoho on Instagram and Twitter. 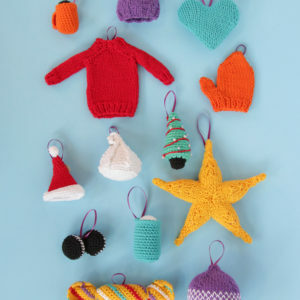 Twelve Ornaments of Christmas, Volume Two!